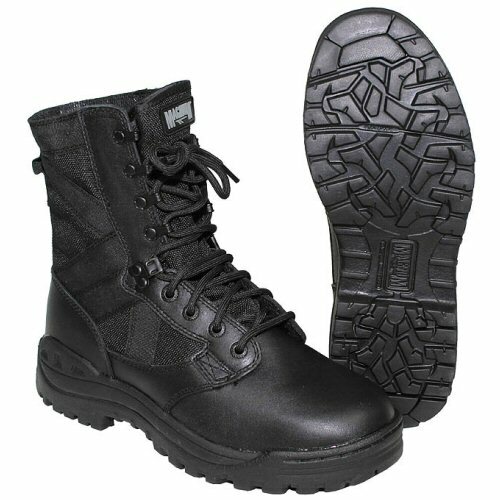 Magnum Amazon Black Patrol Boots, designed as lightweight combat and patrol boots for police and military operators, and also a great work, outdoor and cadet boot. They are manufactured from high quality leather and 1150 Denier nylon upper and shaft. The Magnum lining helps to maximise breathability and comfort. Ergonomically designed and with anti-bacterial silver-based lining to inhibit microbial growth, especially during hot weather wear. The laces are speed loop lacing, based on British army issue combat assault boots. Directly moulded sole with sewn in reinforcement and multi directional grip for stability during rapid changes in direction and speed. Genuine original military issue, surplus stock. Available options are: 6 , 7 , 8 , 9 .